(Nanowerk Spotlight) "Nano Textiles" can be produced by a variety of methods. The key difference among them is whether synthetic nanoparticles are integrated into the fibres or the textile, or are applied as a coating on the surface, and/or whether nanoparticles are added to the nanoscale fibres or coating. However, information about manufacturing methods, the nanomaterials themselves and the quantities used, as well as the "life cycle" of the "nano-treated" textile for sale is largely unavailable to the consumer. The present dossier therefore clarifies nano-textile manufacturing processes and application areas, and gives an overview about the potential effects on the environment and health. Many questions remain unanswered, however, there is a need for considerably more research not only for product development but also into the usefulness and risks which nano-textiles give rise to. The open questions have prompted the Swiss Textile Federation to undertake a joint project with the Swiss Federal Laboratories for Materials Science and Technology (EMPA) entitled "Nanosafe Textiles" and to initiate discussions on the topic. In principle a distinction has to be made as to whether the manufacturing process involves the use of nanoparticles or whether it uses nanostructures (nanometer-thin fibres, nanoporous fibres) without synthetic nanoparticles. Nanoparticles can be introduced into a synthetic material (polymer) and fibres can then be spun from the resulting nanocomposite material, which have a nanoscale, or larger, diameter. Nanometer- thin fibres can however also be manufactured from synthetic material or cellulose without synthetic nanoparticles. In this case the term nanofibre is used to refer to the tiny diameter of the fibres. Figure 1: Manufacture of nanofibres (NP: nanoparticles, CNT: carbon nanotubes). A further possibility is the so-called "refining" of chemical and natural fibres by which nanoparticles themselves are either bonded to the fibre surfaces or are embedded in a coating on them. However, textiles and fibres can also be refined by means of nanoscale metal or polymer coatings, produced by immersion, spraying or plasma processes which do not contain synthetic nanoparticles. 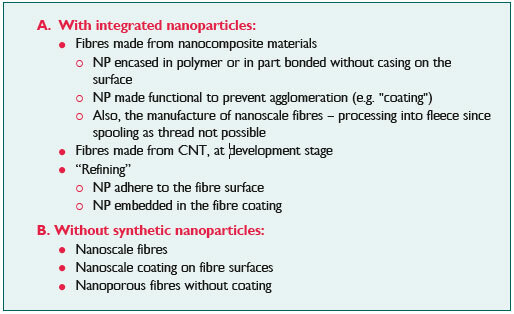 As in the case of fibre manufacture "nano" is used in this instance to refer to the nanoscaling of the coating 1. The potential of nanotechnology in the development of new materials in the textile industry is considerable. On the one hand, existing functionality can be improved using nanotechnology and on the other, it could make possible the manufacture of textiles with entirely new properties or the combination of different functions in one textile material 2. 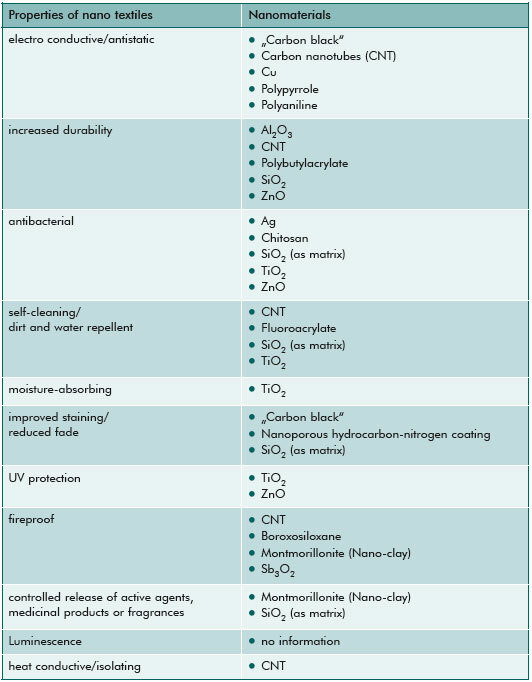 Table 1 gives an overview of the improved properties of textile materials that can be achieved using nanotechnology, including the type of nanomaterials used. Foremost among the applications currently feasible are, in particular dirt and/or waterrepellent and antibacterial textiles and, although they are as yet produced on a very small scale, textiles which give UV radiation protection and so-called "Cosmeto-textiles" (e.g. ladies tights) with woven-in nano-capsules containing special body care substances. Bullet-proof vests containing carbon nanotubes (CNT) are also currently available, as are heat isolating and moisture-absorbent textiles. "Smart clothes" are clothes in which the textile structures themselves perform electronic or electric functions. Despite all the promises, however, they are not yet commercially available. The scenario envisaged involves electronic components which have been reduced in size by means of nanotechnology being completely fused with the textile material resulting in that textile and non-textile components cannot be differentiated and "foreign particles" can no longer be seen or felt. At present initial trials are still focussing on electronic devices or sensors, for example to monitor body functions, being woven into the textiles using conventional clothing technology (e.g. pockets) 3. Researchers are also investigating textile materials made from nanofibres which can act as a filter for pathogens (bacteria, viruses), toxic gasses, or poisonous or harmful substances in the air. Medical staff, fire fighters, the emergency services or military personnel could all benefit from protective garments made from materials such as these. Certain nanofibres can absorb a large amount of moisture, hence textile materials are also being studied for use in agriculture: soaked with pesticides, they could be planted together with seeds, rot at the end of the vegetation period and at the same time fertilize the ground. Futuristic visions even include textile sensors which not only detect pathogens by simply wiping a surface (e.g. of food or surgical instruments), but record them and warn the user, possibly by changing colour 4. According to the manufacturers, there are already quite a number of different nano textiles on the international market. The "Woodrow Wilson International Center for Scholars" in the USA lists 156 articles under the "clothing" category on its nano-product database 5. Our own research 6 into the European and Austrian market in particular, found 82 products in the "clothing" category, six in the category "interior textiles", and eight in the Outdoors sector which have nano-coating (tents, sleeping bags) and one textile product with nano-silver for cleaning purposes. Most of these products are advertised as having dirt or water-repellent properties, e.g. coats and trousers for the Outdoors, or shirts, ties and/or workwear garments with "stain protection". However, there is also a large group of antibacterial textiles containing nano-silver. These consist principally of odour-inhibiting clothing (underwear, T-shirts, socks etc. ), but also include interior textiles products such as cushions, blankets or mattress covers which, according to the manufacturers at least, can be bought on the retail market. Table 1: Overview of the nanomaterials used in textile applications research and possible functions which might be achieved through their use (slight adaptation from 2). A study of scientific publications on nanotextiles has been conducted with the summary that many of the manufacturing methods described are still at the research stage, to some extent they are cost-intensive, and that the integration of nanoparticles can have a negative impact on other textile properties 2. Nevertheless, nano-textiles with almost all the properties cited in Table I are already on the market. It can be assumed that the term "nano" is often used for promotional purposes and that several products do not contain any nanomaterial or that nanotechnology processes were not used in the manufacture. However, this is not just true of the textiles sector but is a phenomenon that applies equally to many other "nano-products". Germany's Hohenstein Institute is a private research and service organisation focusing on research, development, testing, consultation, certification and basic and advanced training, mainly for businesses in the textile industry and associated areas. Together with NanoMat, a network of research institutions and suppliers of nanomaterials, a definition of nanotechnology for the textile industry was elaborated, which is also the basis for the "Hohenstein Quality Label for nanotechnology": "Nanotechnology refers to the systematically arranged functional structures which consist of particles with size-dependent properties." 7 A textile product therefore does not qualify for the Hohenstein Quality Label merely on the basis that it has nanoparticles incorporated within the fibres or that the fibres are enclosed in a nanoscale coating. Rather, the nanoparticles or nanolayers in or on the textile must be systematically arranged (Figure 2) and thus demonstrably result in a new function. At the same time there must not be any negligible negative effect on the textile properties. Further parameters which the Hohenstein Institute can test include resistance to care treatments and wear comfort. These are indicated separately on the quality label. This quality label could be of value to consumers and companies alike and allow a distinction to be made as to whether a product is a "genuine" nano-textile product or whether the word "nano" is being used as a powerful sales catchword for an otherwise conventional product. Only four textile manufacturers have so far taken advantage of The "Hohenstein Quality Label for nanotechnology" for textiles (as at 9.10.09). Are synthetic nanoparticles released from nano-textiles? As shown above, there are different manufacturing processes by which nanoparticles can be integrated in fibres or textiles, besides which there can be variation in how tightly woven the nanoparticles are into the textile material (fibre or coating). It is these factors and the use to which the textile is subjected that determine whether and to what extent nanoparticles can be released from it. It is known that textiles lose between 5% and 20% of their weight during use as a result of abrasion, mechanical influence, irradiation, water, sweat, washing detergents or temperature variations. The possibility therefore cannot be ruled out that nano-textiles might release individual nanoparticles, agglomerates of nanoparticles or small particles of textile with or without synthetic nanoparticles. To date, however, there have been few experimental investigations performed 1. In the case of textiles made from fibres with integrated nanoparticles, however, a lasting functionality at least appears more likely compared with nano-textiles in which nanoparticles are only present in the surface coating or which have been impregnated with them. The few investigations there have been with textiles containing nano-silver show that some products lose up to 35% of the silver in the washing water after only one wash 8 9. It appears to be emerging that during the production process of certain nanoparticles occupational exposure can have negative effects on the health. However there is currently far too little data from laboratory and animal tests to be able to conduct a comprehensive risk assessment 10. Long and stiff CNT in particular are currently regarded as hazardous 11, which primarily affects those involved in their manufacture and who need to have appropriate protection from exposure. The extent to which nanoparticles woven into textiles may or may not be harmful to consumers' health is as yet unknown. As described above, the release of nanoparticles from textiles as a result of use, aging, abrasion etc. cannot be ruled out. Nevertheless, suitable studies are absent to clarify the exposure as well as the possible hazard potential. Nano-silver is already used for its antimicrobial properties in a wide range of consumer products and hence also textiles. Some dubious product value conflicts with potentially negative effects on health 12. On the one hand, materials with nano-silver particles (integrated into textile fibres or as a fibre coating) are used to manufacture textiles that are relatively odourless, yet the effects on the natural skin flora have not been tested (see below). On the other hand, nano-silver is also used for clothing which is supposed to protect people suffering from neurodermatitis (atopic dermatitis) from becoming infected with staphylococcus aureus, a bacterium which is suspected of exacerbating the symptoms of neurodermatitis. Clinical studies have so far not confirmed an actual positive effect of textiles with nano-silver in cases of neurodermatitis 13. The German Federal Institute for Risk Assessment (BfR) does not see any advantage in the reduction of bacteria on textiles and warns against potential negative effects such as a weakening of the immune system and the possibility of silver-resistant bacterial strains development. The Institute also fears that consumers could develop a false sense of security and neglect general hygiene (washing garments) 14. In recent years antibacterial textiles using nano-silver have been developed to minimise odour formation by reducing the number of bacteria. Fresh sweat is initially entirely odourless. It is only the influence of certain bacteria of the skin flora that produces the typical, and to some extent unpleasant, body odour. Silber ions are effective against a broad spectrum of bacteria 15 and this mechanism is supposed to be used to kill the odourforming bacteria. In other words, when contact is made with the skin an unspecific effect can be expected on the skin flora. The Hohenstein Institutes have carried out in-vitro tests with antibacterial textiles and examined their effects on skin flora 16. The results indicate that bacteria are evidently only killed in very close and direct contact with antimicrobial- treated fibres. In the case of human skin flora this means that it can only be influenced when it is in direct contact with the treated fibre. However, since only a few textile fibres have direct and, at most, temporary points of contact with the skin, depending on their construction and the type of fibre, no dramatic transformation in the skin flora is to be expected in respect of the number of bacteria. Furthermore, investigations with disinfectants show that approximately 20% of skin flora bacteria are located too deep in the skin for them to reach 17. The bacteria population is hence only reduced for a short period and after some time the skin bacteria are filled up again from deeper skin depots (sweat pores, hair follicles) to make up the deficit created 16. The same effect may be expected where nano-silver is used. However, more investigations are needed since silver nanoparticles can also penetrate into deeper skin layers because they are so small 18, and release their antimicrobial effect on the resident skin flora. To date there have been no significant studies of the longterm effects of nano-silver in textiles on natural human skin flora. As there have been no investigations on the release of nanoparticles from textiles, their potential risk to the environment cannot be assessed. Most probably however nanoparticles are released during washing, entering the environment via the waste water. In this case it is principally nano-silver's antimicrobial properties which make it hazardous because silver ions are toxic for aquatic organisms as well as for microorganisms in the soil. Damage to the bacteria used in the biological purification of waste water in sewage plants likewise cannot be ruled out (cf.12). Initial studies substantiate the fact that nanosilver can be released from textiles in differing quantities and forms. One study has investigated the quantities and forms of silver (nano-sized or larger) which were released from nine different fabrics into the water whilst washing in the washing machine. It concluded that the percentage of the released silver varied considerably between individual products (1.3 to 35%) and is dependent on the manufacturing method 9. Products which had the silver woven into the fibres released very little silver. Silver was mostly released from materials washed in the washing machine in particle sizes of >450 nm, which the authors interpreted as an indication of the importance of the mechanical influence. A product with conventional silver refining (several µm-thick silver coatings of the fibres) showed no significant differences in respect to the distribution of sizes of the silver particles released. Nano-titanium dioxide, which is also used in the manufacture of nano-textiles, also has to be considered hazardous because of its potential environmental impact. When water and UV exposure are present nano-titanium dioxide produces free oxygen radicals which are toxic for aquatic microorganisms. This can damage the ecological balance of stretches of water. However, there are still no investigations to the mechanisms of the toxicity or the impact on natural ecosystems 19. 3 Mecheels, S., Schroth, B. and Breckenfelder, C., 2004, Smart Clothes ? Intelligente textile Produkte auf der Basis innovativer Mikrotechnologie. Expertensicht ? Beispiele ? Empfehlungen: Hohensteiner Institute. 5 www.nanotechproject.org, (as at 3.11.09). 6 Gre?ler, S., Nentwich, M., Simk?, M., Gazs?, A. and Fiedeler, U., 2009, Nano-Konsumprodukte in ?sterreich. NanoTrust Dossier No. 009, epub.oeaw.ac.at/ita/nanotrust-dossiers/ dossier009.pdf. 8 Benn, T. M. and Westerhoff, P., 2008, Nanoparticle Silver Released into Water from Commercially Available Sock Fabrics, Environmental Science & Technology 42(11), 4133-4139. 9 Geranio, L., Heuberger, M. and Nowack, B., 2009, The Behavior of Silver Nanotextiles during Washing, Environmental Science & Technology 43(21), 8113-8118. 10 Aitken, R. J., Hankin, S. M., Ross, B., Tran, C. L., Stone, V., Fernandes, T. F., Donaldson, K., Duffin, R., Chaudhry, Q., Wilkins, T. A., Wilkins, S. A., Levy, L. S., Rocks, S. A. and Maynard, A., 2009, EMERGNANO: A review of completed and near completed environment, health and safety research on nanomaterials and nanotechnology, im Auftrag von: Defra, Nr. TM/09/01: IOM. 11 Simk?, M., Gazs?, A., Fiedeler, U. and Nentwich, M., 2009, Nanopartikel, Freie Radikale und Oxidativer Stress. NanoTrust Dossier No. 012, epub.oeaw.ac.at/ita/ nanotrust-dossiers/dossier012.pdf. 12 Fries, R., Gre?ler, S., Simk?, M., Gazs?, A., Fiedeler, U. and Nentwich, M., 2010, Nanosilver. NanoTrust Dossier No. 010en, epub.oeaw.ac.at/ita/nanotrust-dossiers/ dossier010en.pdf. 13 Birnie, A. J., Bath-Hextall, F. J., Ravenscroft, J. C. and Williams, H. C., 2009, Interventions to reduce Staphylococcus aureus in the management of atopic eczema (Review), Cochrane Database Syst. Rev. 2008 Jul 16; (3): CD003871. 14 BfR, 2006, 12. Sitzung des Arbeitskreises "Gesundheitliche Bewertungen von Textilhilfsmitteln und -farbmitteln" der Arbeitsgruppe "Textilien" des BfR: Bundesinstitut f?r Risikobewertung www.bfr.bund.de/cm/207/bericht_ueber_die_ 12_sitzung_des_arbeitskreises_ gesundheitliche_bewertung.pdf. 15 Wijnhoven, S. W. P., Peijnenburg, W. J. G. M., Herberts, C. A., Hagens, W. I., Oomen, A. G., Heugens, E. H. W., Roszek, B., Bisschops, J., Gosens, I., Van De Meent, D., Dekkers, S., De Jong, W. H., Van Zijverden, M., Sips, A. J. A. M. and Geertsma, R. E., 2009, Nano-silver ? a review of available data and knowledge gaps in human and environmental risk assessment, Nanotoxicology 3(2), 109-138. 16 H?fer, D. and Mecheels, S., 2004, Textilien, Hautflora und Geruch, No. 62: Hohensteiner Institute. 17 Haustein, U.-F., 1989, Bakterielle Hautflora, Wirtsabwehr und Hautinfektionen, Dermatologische Monatsschrift 175(11), 665-680. 18 Larese, F. F., D'Agostin, F., Crosera, M., Adami, G., Renzi, N., Bovenzi, M. and Maina, G., 2009, Human skin penetration of silver nanoparticles through intact and damaged skin, Toxicology 255, 33-37. 19 Battin, T. J., Von der Kammer, F., Weilhartner, A., Ottofuelling, S. and Hofmann, T., 2009, Nanostructured TiO2: Transport Behavior and Effects on Aquatic Microbial Communities under Environmental Conditions, Environmental Science & Technology 43(21), 8098-8104.